Time to celebrate! My brother, Dennis, is finally graduating university. As an added bonus, he recently got hired for a full time position. Two reasons to celebrate…and the family decided to honour these achievements by having a good meal. My parents and I hardly go out to fancy restaurants compared to Dennis and Amanda (his girlfriend), so we let them decide the menu for the night. *Some pictures might have a black shadow by the lower bottom, sorry, that’s my len’s shadow (used flash). 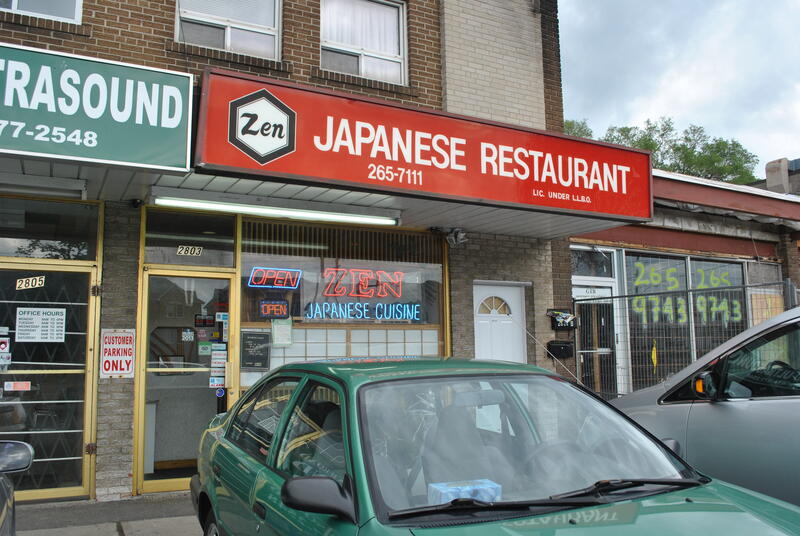 Zen, located in an isolated part of the city but the restaurant has it’s popularity (the night that we went for dinner, the restaurant had reservations for the night and did not let any walk-ins. The restaurant is small, enough to fit 4 tables for parties of four each, and two party rooms plus a bar that seats 5 (I think). 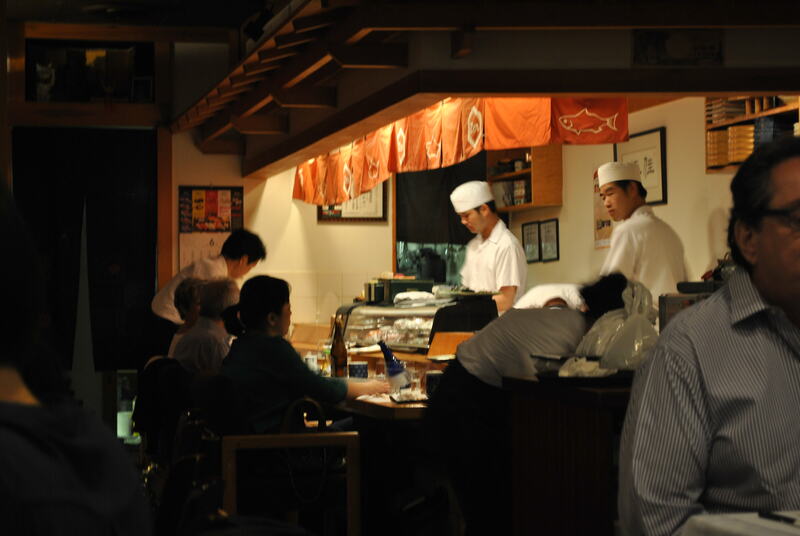 There are about three waiters and waitresses that were really polite and two sushi chefs. The bar, two chefs making sushi for the whole restaurant. The tables that seat four were really small. 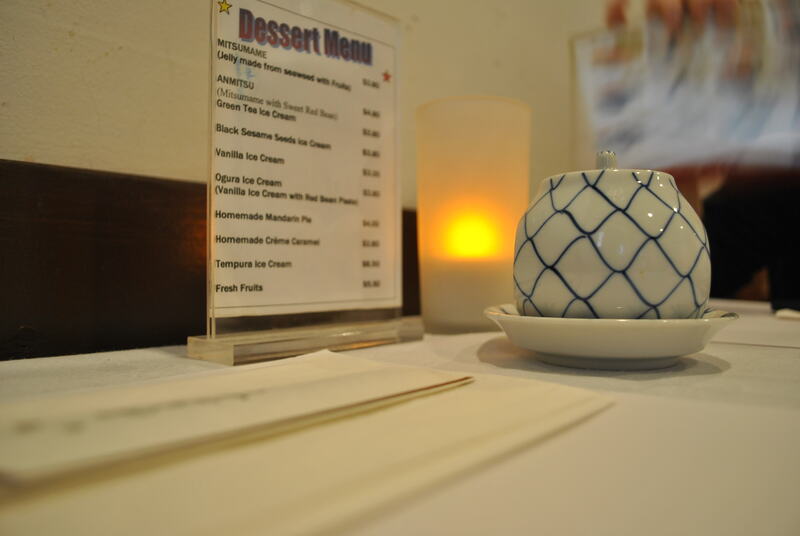 Aside from that, there was a cute soy container and a dessert menu plus a fake candle light. We were served with huge green tea mugs with little plates of edamame (for appetizers). 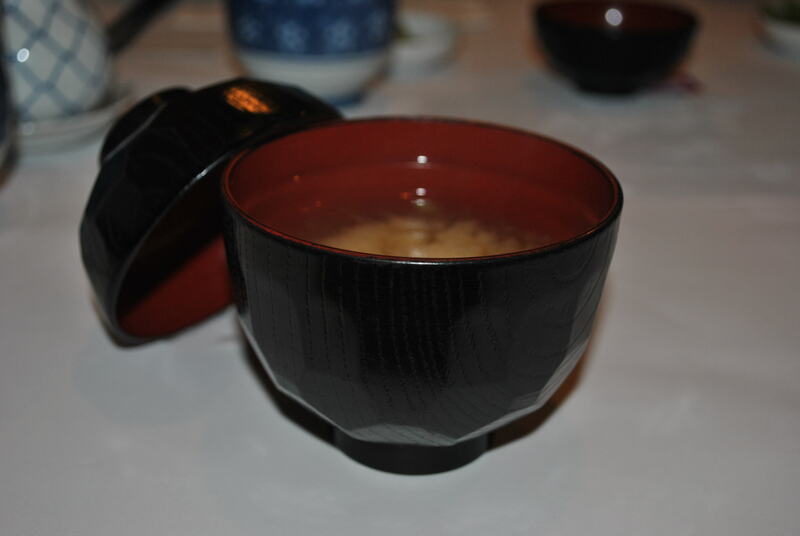 I love when I order miso soup that’s served in these cute bowls with their covers. First order that come. 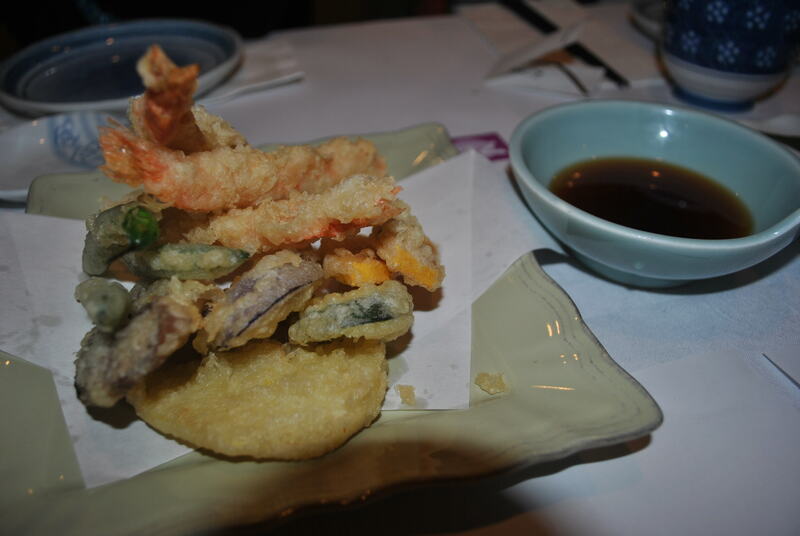 Shrimp and vegetable tempura. I loved the assortment of vegetables given. When I go to other Japanese restaurants, I usually get shrimp, eggplant and button mushrooms. This was quite the surprise, as the usual veggies were served, but with green beans and a change from button mushrooms to some sort of Japanese mushroom. 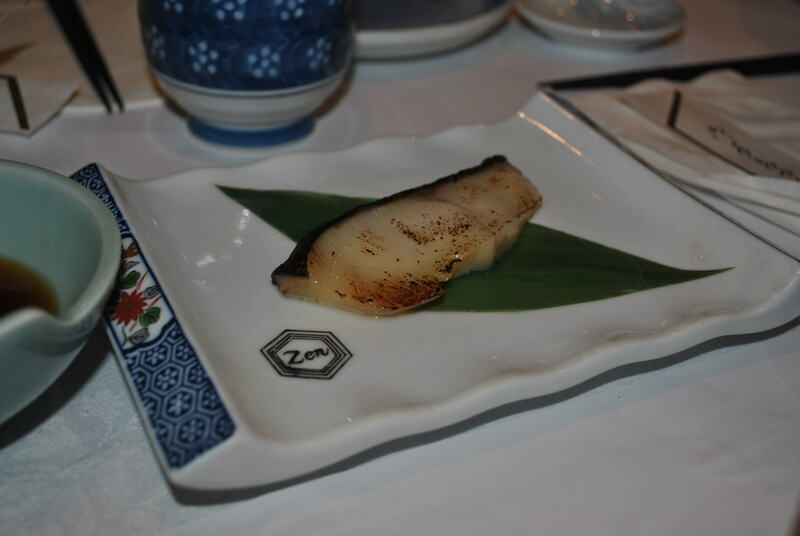 Gindara– cod with glazed soy. It’s semi sweet and cooked just right. 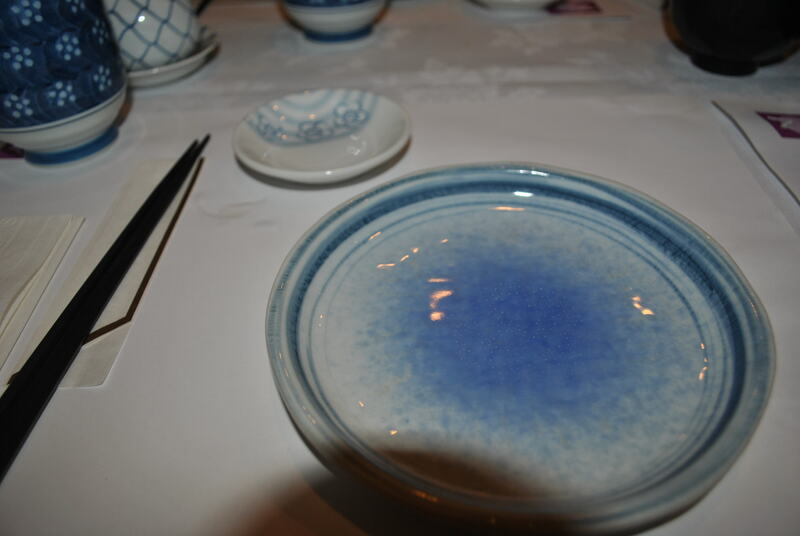 A nice little plate for soy and a medium sized for eating. Simple dinner setting. I made Dennis take a picture of the entrance. 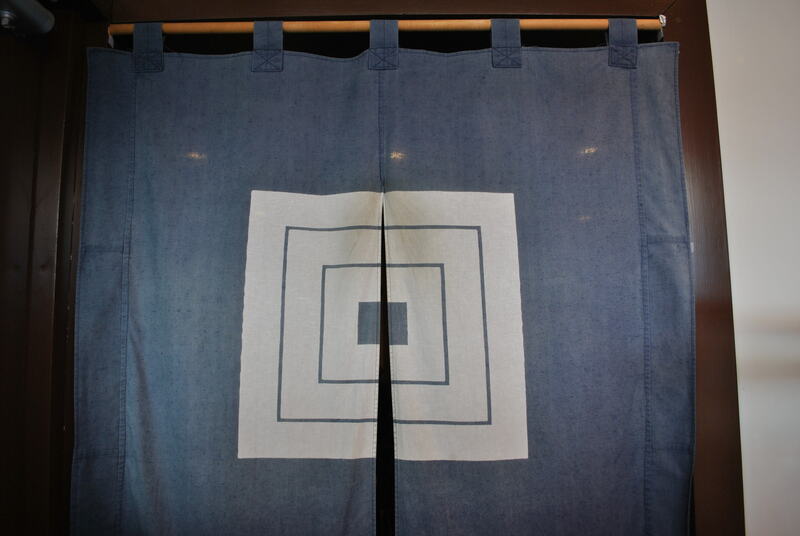 After walking in past the front glass door, the customers are greeted to this cloth-curtain. Our table was just past the curtains and to the left, by the entrance. I would call this piece or restaurant setting ‘authentic.’ It is really rare that Japanese restaurants (that I go to) have these. 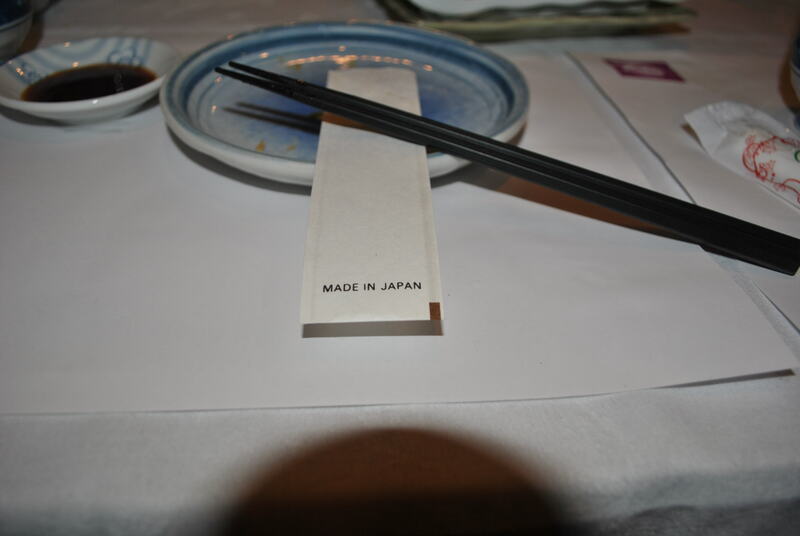 While waiting for our dishes to come, mid way, someone noticed that the paper with the chopsticks is made in Japan. I have never noticed or seen that before. Thumbs up for that! 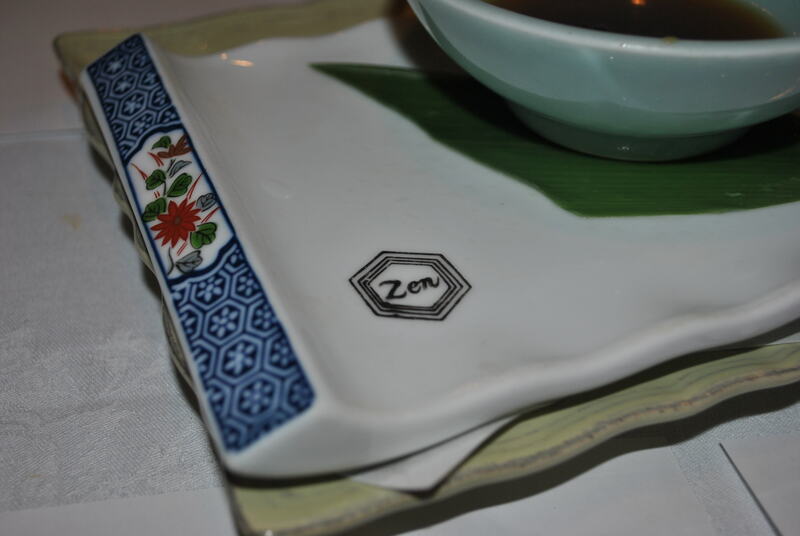 Fancy restaurant for having the restaurant name on some of the dishware. Too much seafood? 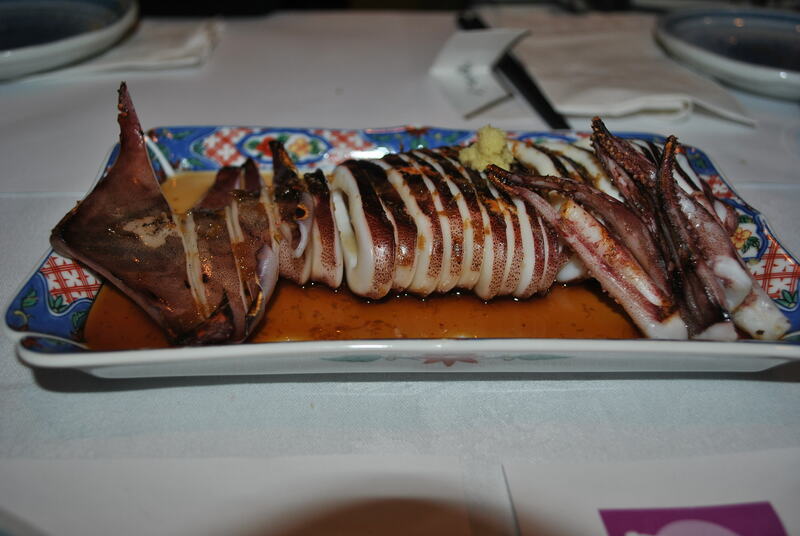 Sliced grilled squid in ginger soy. I couldn’t find the dish name on the online menu. 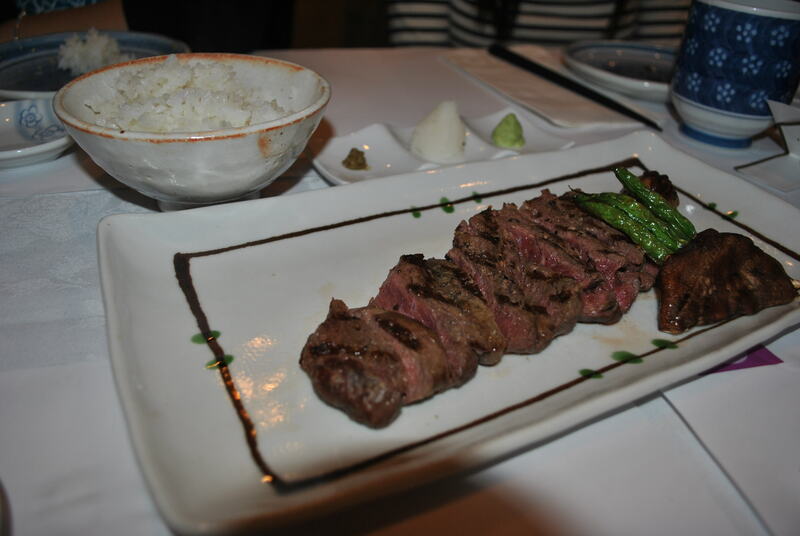 Japanese Style Steak. Grilled beef with asparagus. 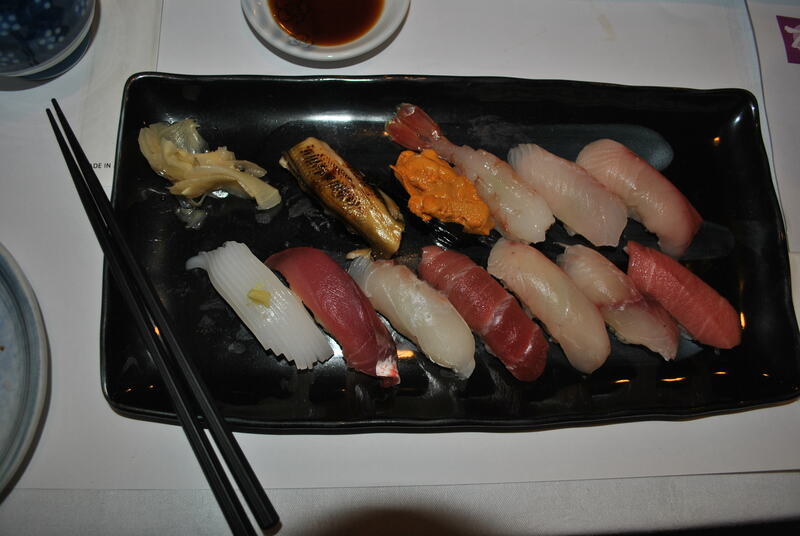 Omakase Sushi. I am pround to say that I enjoyed this part of dinner. Some fish just melted in my mouth. 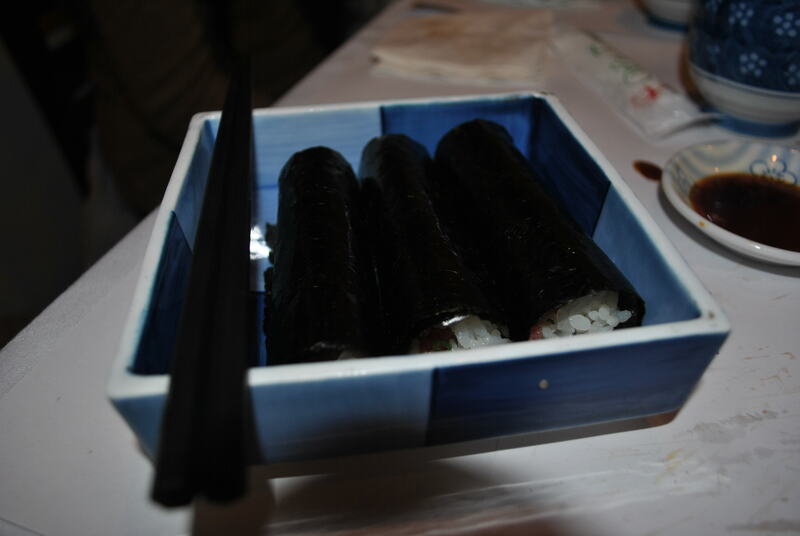 These were second best, next to the Omakase Sushi. The nori was extra cripsy with rice and finely chopped red tuna. Everyone got one, I think it comes with the Omakase Sushi meal. 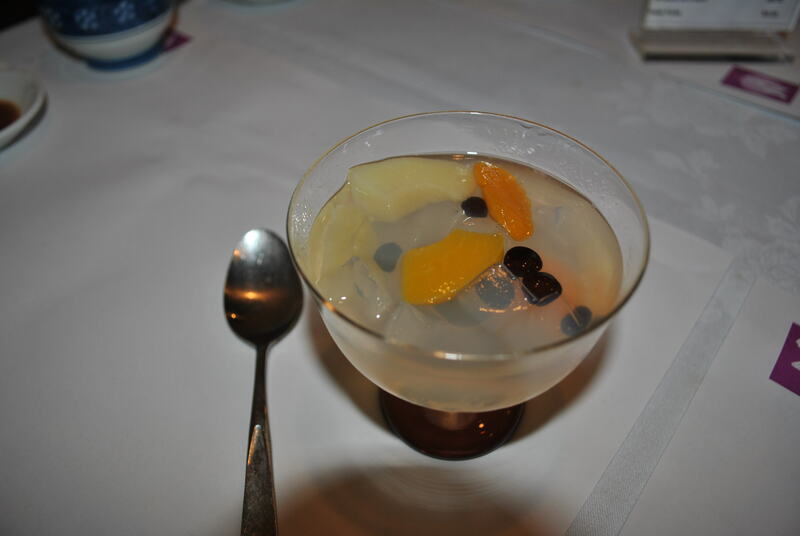 Dessert: mitsumame–jelly with red beans and canned fruit. Google mitsumame, it’ll give a better description. Verdict: It was nice, but the service was rushed. We had so many dishes and time deciding what we should order. From the time we walked in to the time we said Thank You to the waiters and waitresses, it had only been an hour.